Sludge Doom whose crawling funerary pace is now and then woken up by soaring tempos conveying an apocalyptic feel to the whole. The voice is a hoarse growl burried in the mix. 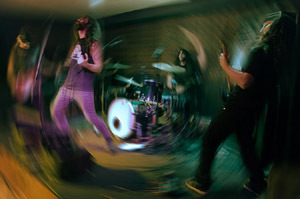 Musically, the band offers a thick block of droning Doom where emphasis is put on lo-fi rendition, fuzz and reverb.